Bookmark this page and come back every month, or sign up for our mailing list, for crucial updates about how you can show up for Census 2020! Every ten years our federal government conducts the Census, a count of every person residing in the United States, so that they can allocate funds for programs like Medicaid, public housing, and food stamps, and so that they can make sure that our federal, state, and local elected officials are representing roughly the same number of people. Attorneys, advocates, activists, and service providers then use those data to press decision-makers for change, to show the needs of their communities, and to enforce our civil rights. For the Census to work–to direct funds to the right places and to help all of us access democracy–it has to count everyone in the country. Unfortunately, it doesn’t. Every decade, the Census misses or undercounts hundreds of thousands of marginalized people, including low-income people, people of color, and very young children. At the same time, it over counts, or double counts, hundreds of thousands of people with the most privilege, including the white population, homeowners, and wealthy people. Overcounts of privileged people and undercounts of marginalized people reinforce systems of power and oppression in this country. 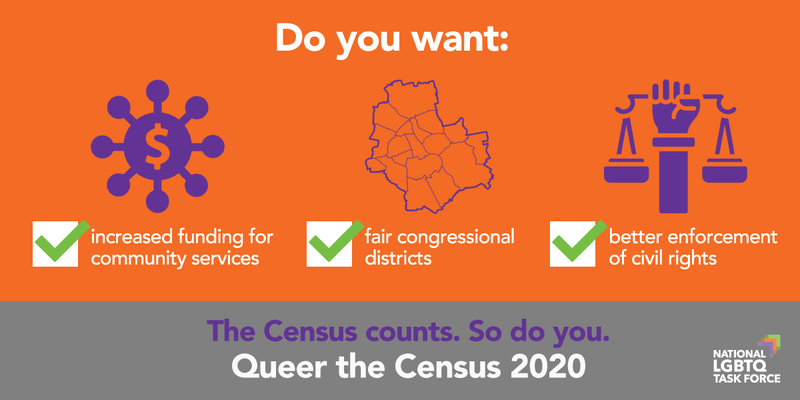 That’s why the Task Force is working with our colleagues in the LGBTQ and social justice movements to ensure that all of us, and especially people from marginalized communities, are counted on the 2020 Census.